"This is a healthy dish. Eat it in a sandwich, on lettuce, or as a stand-alone meal." Bring water and quinoa to a boil in a saucepan. Reduce heat to medium-low, cover, and simmer until quinoa is tender and water has been absorbed, 15 to 20 minutes. 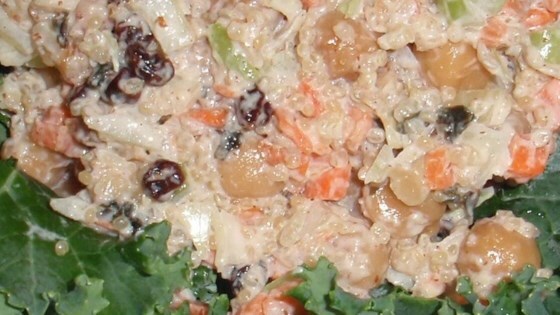 Fluff quinoa with a fork and refrigerate until cold. Combine chickpeas, carrot, celery, sunflower seeds, cabbage, and onion in a food processor and pulse until everything is roughly equal in size; transfer to a large bowl. Stir quinoa, almonds, and raisins into the chickpea mixture; add mayonnaise, mustard, kelp flakes, relish, lemon juice, salt, and pepper. Stir the mixture until evenly seasoned. See how to make an out-of-this-world quinoa salad with a tangy kick! I used currants instead of the raisins to keep things a small uniform size. The hidden extras, the nuts and the seaweed made this an interesting salad! Delicious! My husband appreciated this!